The number of top-ranked “princelings” in China’s military is steadily dropping. The recent appointment of Lieutenant General Zhou Xiaozhou as deputy commander of the Chengdu Military Region has been widely regarded as a sign of the rise of princeling generals in Chinese politics. The son of Lieutenant General Zhou Yibing, former commander of the Beijing Military Region (from November 1987 to April 1990), Zhou Xiaozhou, aged 58, began his military career in 1973 and worked in the 27th Army and 14th Army before his promotion to chief of staff in the Chengdu Military Region in 2012. He was awarded the rank of lieutenant general in 2013 and appointed deputy commander of the Chengdu Military Region in December 2014. One may also note that Lieutenant General Wang Ning, aged 59, the new commander of the People’s Armed Police, has also come from a military family. His father was an officer of the deputy army commander rank in the Nanjing Military Region; his uncle, General Gu Hui, was commander of the Nanjing Military Region in the 1990s; and his father-in-law, Lieutenant General Du Ping, was No. 7 political commissar of the same military region in the 1960s, 1970s, and early 1980s. Strictly speaking, these cases belong to different categories of princeling generals. Zhou Xiaozhou is a typical example of princeling generals by birth — sons and daughters of former high ranking officers/officials of the Chinese Communist Party (CCP). Wang Ning represents princeling generals by marriage — sons-in-law and daughters-in-law of former high ranking officers/officials of the CCP. In the former category, one may also find other princeling generals such as General Zhang Youxia, director of the General Armaments Department; General Ma Xiaotian, commander of the PLA Air Force; Admiral Wu Shengli, commander of the PLA Navy; and General Liu Yuan, political commissar of the General Logistics Department. In the latter category, one may also find other princeling generals such as General Liu Yazhou, political commissar of the National Defense University. Taken together as one group, however, princeling generals have been in decline in Chinese politics. Since 1994 when the first military princeling was awarded the rank of general, nine of them (including six princeling generals by birth and three by marriage) have been promoted to this rank. At the beginning of 2015, however, there were only five princelings with the rank of general left. Four of them (Zhang Youxia, Wu Shengli, Ma Xiatian, and Liu Yuan) are princeling generals by birth, and one (Liu Yazhou) is by marriage. But Liu Yuan is likely to retire in 2016 at the age of 65; Liu Yazhou, Wu Shengli, and Ma Xiaotian are also likely to retire in 2017 due to their age. Only Zhang Youxia would stay on beyond the 19th Party Congress in 2017. Hence, despite some recent promotions, we are actually seeing the decline of princeling generals in Chinese politics. 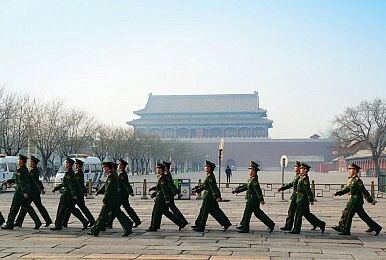 The military comes out in support of the changes, which would allow Xi to hold the presidency indefinitely.